This post is sponsored on behalf of Campfire® Marshmallows. I’m proud to be continuing my partnership with Campfire Marshmallows in 2015. Thank you for supporting the brands that I love and that make Jelly Toast possible. After having lived in Ohio for 32 years you think that I would have learned by now that weather at anytime of the year is extremely unpredictable. You might need a sweater in July and shorts in October. You just never know. A few weeks ago, I discovered a crack in the toe of my big winter boots that have been serving me well these last few years. In a fit of optimism and rare tidying, I tossed them into the garbage thinking two things: cracked snow boots were not going to be much help and chances are it won’t snow again anyway. How naive can I be? Well, my first thought was right as there is nothing comforting about wet, cold toes. But unfortunately, my second thought was a bit off base. Pulling out of my garage this morning I was greeted with a slush storm that resembled falling, melted snow cone. It was as pleasant as it sounds. Then, halfway through our 10 minute drive to school it turned into bonafide snow fall and by lunch time, there was a layer of snow on the ground. Not much, but enough considering it’s March 26th. There wasn’t a whole lot I could do but laugh and try to figure out if an umbrella or a winter hat was the more appropriate defense against what was falling from the sky. On the walk into school we were greeted by countless parents who would catch each others eyes with a bemused expression as if to say, “Can you seriously believe this?” I knew I wasn’t the only one who was looking forward to heading home or off to work to bolster themselves with a cup of coffee and some serious thoughts of Spring. C and I went back home, and after starring out the window at the gray sky and falling snow, we decided we needed to whip up something that would bring a little Spring to our house. 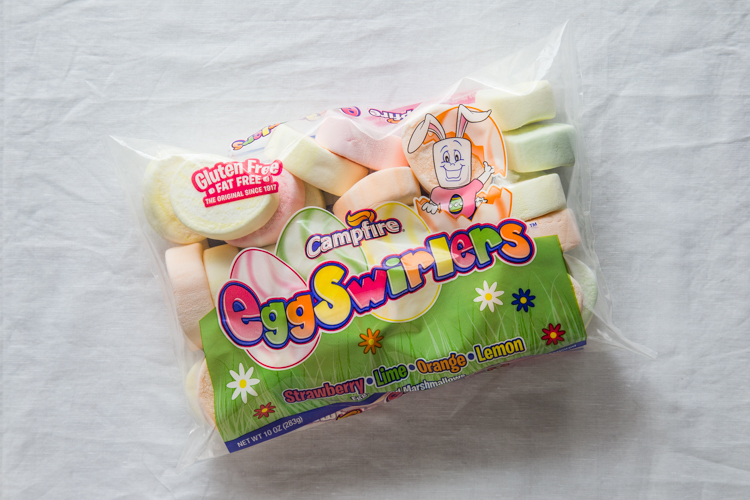 And nothing was more Spring-y in my house than my bag of Campfire® Marshmallows EggSwirlers. Secondly, their flavors are incredibly delicious, light and fluffy in texture. The orange is my favorite and it’s like eating a creamsicle. C loves the pink and every year when the EggSwirlers come pop up in stores (I found mine at Walmart) we get so excited and stock up on several bags: some for snacking and some for making into fun desserts. Today was a “make into a fun dessert” kind of day. We needed a little cooking therapy, but also had critical activities on our to do list that included “playing with My Little Pony dolls” and “catching up on the new episode of Odd Squad”. We’re talking majorly important tasks. Have you seen the show, Odd Squad, by the way? It’s hilarious and totally up my kids’ ally. Due to our pressing activity schedule, I wanted to make something simple, but tasty. We opted for individual No Bake Marshmallow Cheesecakes. They start with simple graham cracker crust and are a filled with a mixture made with melted EggSwirler marshmallows, cream cheese and whipped topping. This recipe couldn’t be simpler to make! All in, they take 20 minutes, plus some time in the fridge to let them set. The final cheesecakes are sweet, but not too sweet. 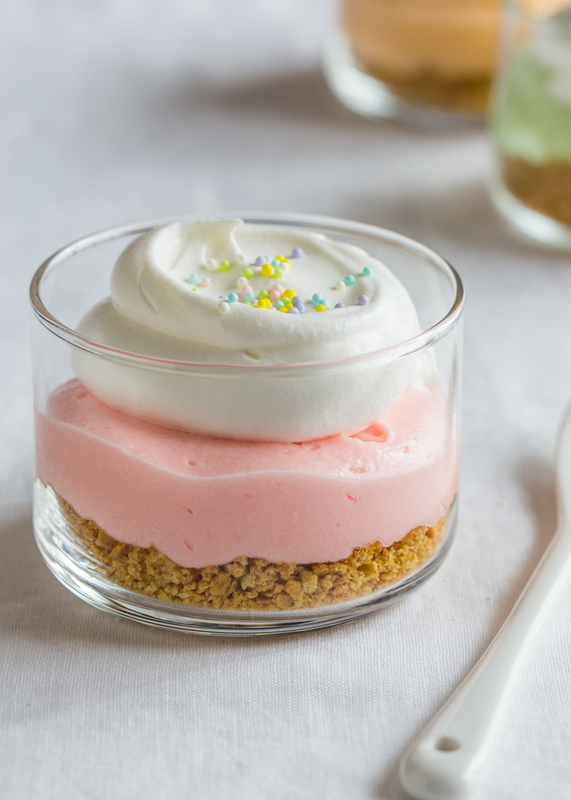 The marshmallows give the no bake cheesecakes a pillowy texture that is almost mousse-like. 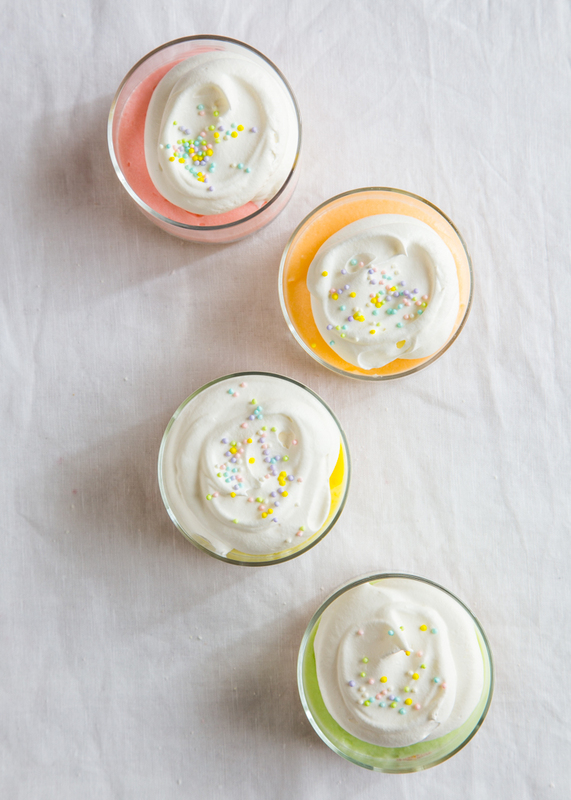 The flavors of the EggSwirlers give these little cheesecakes so much personality, plus everyone can pick their favorite flavor with no extra work for you. How fun is that? 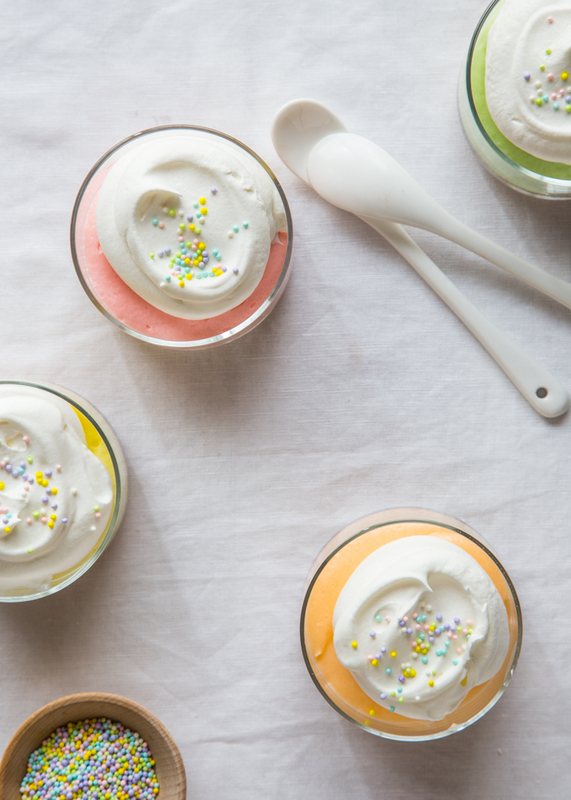 These have Easter dessert written all over them. And the best thing ever is that they totally brightened up our gray, soggy day. It’s hard to ask more than that, right? Divide the bag of EggSwirlers into the four colors. Sounds tedious but it takes all of 10 seconds and is totally worth it to keep flavors un-muddled. C took that job; she loved sorting the colors into 4 microwave safe bowls. Easy peasy. When mixing the cream cheese and melted marshmallows, there will come a moment when you might look at the consistency and think that something went wrong. Don’t panic! Keep stirring gently and fold in the whipped topping until the mixture is fluffy looking and smooth in color. It worries me every time I make these, but it always works out. Use a honey drizzle or a push-up pop plastic tube bottom to tamp down the graham cracker crust. The both work great! from Libby that I use all. the. time. Seriously, they are amazing for desserts! For more information about these light and fluffy Campfire EggSwirlers as well as Easter and Spring recipe inspiration, visit Campfire on their website, Facebook, Pinterest, Instagram and Twitter. Be sure to check out our Marshmallow Maddness Pinterest board, especially if you’re a Pinterest junky like me! 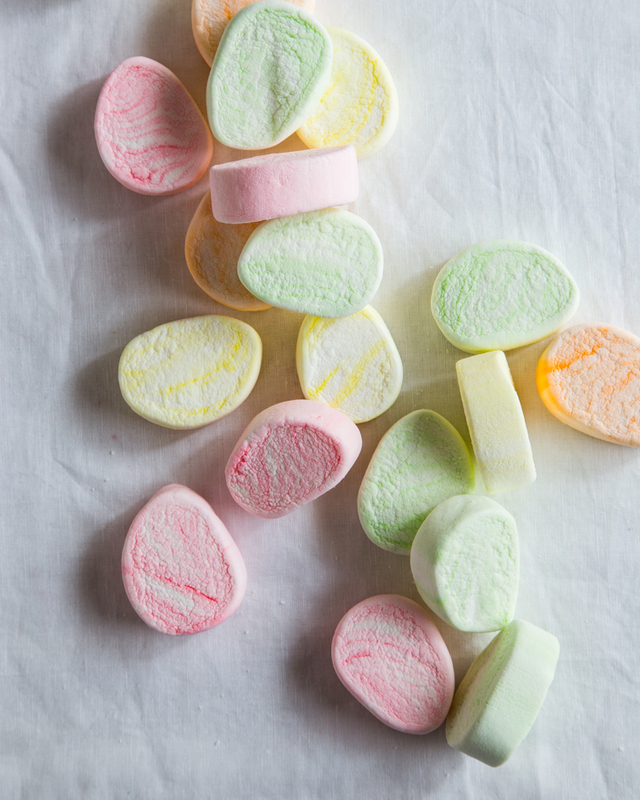 We are always pinning new and exciting recipe and craft ideas that feature, you guessed it, marshmallows! In a medium bowl, mix together graham cracker crumbs, melted butter and sugar. Divide among 8 4-ounce ramekins or jars and press down firmly. Chill until ready to use. 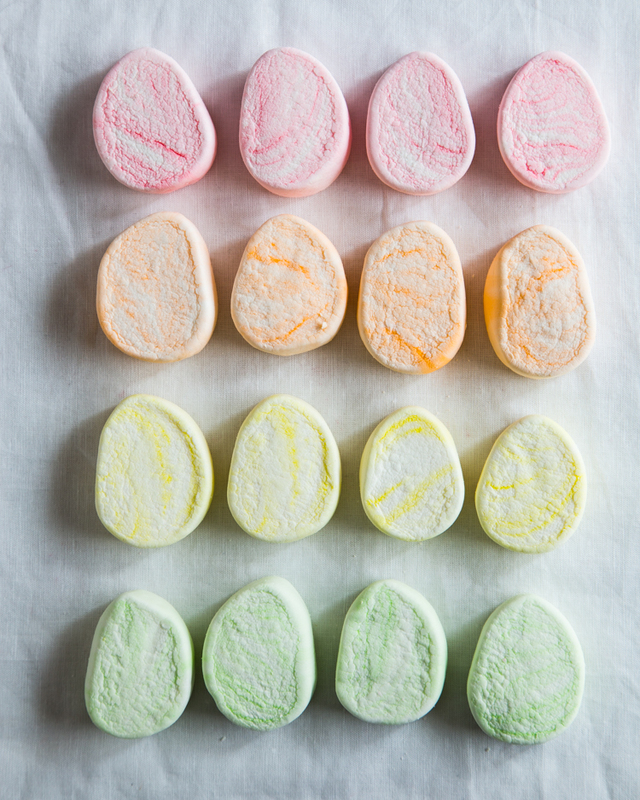 Place seven of each color of EggSwirler into 4 separate microwave safe bowls (ex: 7 pink marshmallows in 1st bowl, 7 orange marshmallows in 2nd bowl, etc). Working with one color at a time, microwave the first bowl on high for about 30 seconds or until marshmallows are melted and puffy. Use a fork to stir in 1/4 of the cream cheese into the marshmallows until the mixture is a consistent texture. This may take a minute or two. Gently fold in 1/4 of the whipped topping until the mixture is light and fluffy. Divide mixture in half and spoon or pipe into two of the prepared ramekins. Repeat steps 3-6 with the remaining 3 marshmallow colors until all 8 prepared ramekins are filled. Chill the no bake cheesecakes for at least 30 minutes or until firm. Top with whipped topping and sprinkles and serve! When mixing the cream cheese and melted marshmallows, there will come a moment when you might look at the consistency and think that something went wrong. Don't panic! Keep stirring gently and fold in the whipped topping until the mixture is fluffy looking and smooth in color. It worries me every time I make these, but it always works out. I would have felt the same way had I had weather like that now. I’m so done with winter! 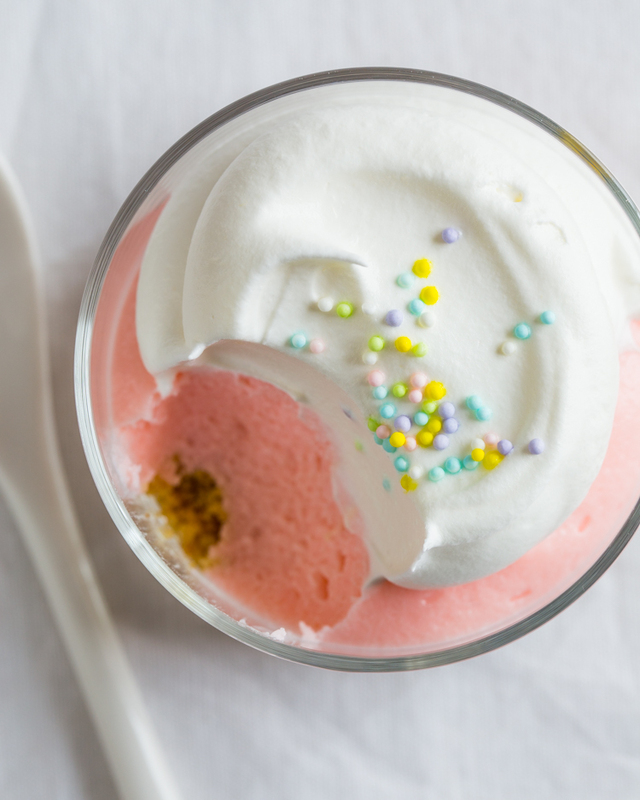 This is a gorgeous dessert – so festive and fun! And springlike!! Thanks so much, Kristen! I’ve been checking the weather like a mad woman, hoping that some warmth is coming our way. especially after a weekend of snow flurries. Hi Penny, I’m not sure if Campfire Marshmallows are available in Australia, however you can check their store locator to be sure. Frozen Whipped Topping is found in the frozen dessert section. One brand I use often is Cool Whip. I hope that helps! Thanks for stopping by! How big are your marshmallows? I will have to buy different brand as we don’t have colourful ones. Great post and photos! I feel motivated to make your sweet cheesecakes :).